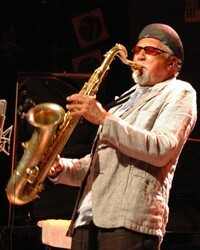 Posted on Tue, Apr 10, 2012 : 7:35 a.m.
Charles Lloyd has always had his feet in two different worlds. As a jazz saxophonist, he first established himself in the 1960s' post-bop landscape both as a leader and as a sideman with a particularly lyrical style that was sometimes at odds with the more-jarring sounds of the time. But as the 1960s progressed, Lloyd emerged as jazz’s primary link to the counterculture and all the hippie symbolism that came with it. Today, after a handful of retirements and other musical side journeys, including recurring stints as a sideman with the Beach Boys, Lloyd is playing as well—and as lyrically—as he ever has. Not surprisingly, the tenor saxophonist, who brings his New Quartet to the Michigan Theater on April 14 for a gig under the auspices of the University Musical Society, found a typically Zen-like way to sum up his musical approach. When: 8 p.m. Saturday, April 14. How much: $18-$44, available via ums.org. Lloyd is 73 now—no longer the young lion finding common ground between the jazz and counter-cultural realms. But that doesn’t necessarily mean he’s changing his approach. “There’s a lot of passion in here still and the fires are burning,” he said. “I never changed, you know; I never veered. Lloyd makes a lot of references to singing. And with good reason: Of all the reedmen of the post-bob era, perhaps none played with as lyrical approach as Lloyd, who was never afraid that his notes might come across as too pretty. Throughout his long career, Lloyd has never shied away from experimentation. He’s dipped his toes in free jazz, soul-jazz and world music without ever compromising his position as a giant—if perhaps an overlooked giant—in modern jazz. Now, with his New Quartet—pianist Jason Moran, 36; bassist Reuben Rogers, 36; and drummer Eric Harland, 34—Lloyd appears willing to look back, while continuing to look forward. These aren’t mere sidemen, in fact, each has led his own bands. As during his heyday with contemporaries like Billy Higgins, Jack DeJohnette, and Keith Jarrett, Lloyd has a cohort of players, who are able to adapt to his agile whims. Wih these young cats pushing him forward, Lloyd appears as willing to revisit gems like “Forest Flower” as he is an out-jazz workout. “I’m so blessed that I have peers with me,” he told Jazz Times. “It’s refreshing to have guys of this quality and character. People say, ‘You have this young band.’ I don’t think like that because we all get on the wavelength. Tue, Apr 10, 2012 : 1:20 p.m.
His last performance in Ann Arbor was brilliant. Just a beautiful player. Plus his &quot;sidemen&quot; would make an amazing trio on their own. With no dedicated jazz club in Ann Arbor, this is a must see show. WEMU is giving tickets away!